Moonrise is a WordPress restaurant theme made by Organized Themes. It is the perfect WordPress cafe theme, but it just as well fits any other kind of a restaurant business you might be running. Moonrise has been designed to be as flexible as possible. By using it, you can choose to build a one-page website that looks splendid, but you can also make a blog and add as many inside pages as you find needed. This theme has all the standard features a great restaurant theme should have, but it also offers many other handy tools that will make your website look and feel amazing. When it comes to the homepage of Moonrise, it is absolutely unique and it looks very attractive. You can add your own images to the homepage and use up to seven different sections for your content including: food menu, services, a slideshow, page content, contact, widgets and contact blocks. The menu section is very easy to customize, just as all the other sections. You are given the possibility of placing your own introductory text before each and every section, and before each menu group. The same goes for services, page contact, and any other section. There is also a staff section where you can introduce all the people who make your restaurant a special place to your visitors, by creating a small bio for each one of them, with a suitable photo added. Setting up the theme is a piece of cake. 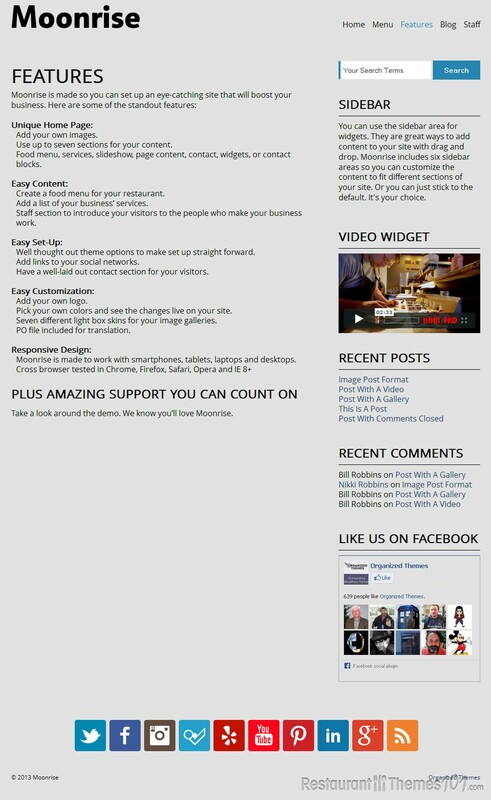 You can also choose to link your social networks right on your homepage, and create a nice contact section. Adding your own logo is very easy, as well as choosing your own colors. There are seven different light box skins you can choose from for your image galleries. A .po file is included in the theme for easy translation. This theme has a responsive design so it can work perfectly well no matter what device you are using. It works with smartphones, tablets, laptops and desktops, and when it comes to browsers, it is cross-browser tested in Chrome, Firefox, Safari, Opera and IE 8+.